Cordyceps mushroom extract powder comes from Cordyceps militaris, a species of fungus that thrives in mountain environments, particularly in China, Tibet, and other East Asian countries. Cordyceps is derived from the Greek word kordyle, which means “club,” and the Latin suffix –ceps, meaning “head.” The fungus has been used traditionally for thousands of years. 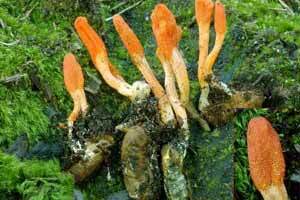 Cordyceps militaris in the wild is a parasitic fungus. It survives by infecting caterpillars and other arthropods, using the body to grow, develop and eventually spread. Cordyceps fungi are rich in phytonutrients, or plant chemicals, that may have various effects on human health. Cordycepin is the main component of Cordyceps militaris and a powerful chemical featuring a wide range of possible beneficial properties. Cordyceps is also rich in polysaccharides, a type of carbohydrate comprising a string of monosaccharaides. Polysaccharides may play various roles in the human body, particularly regarding the digestive system and immune functions. Cordyceps militaris is known to contain beta-glucan polysaccharides. The fungus also contains adenosine, which combines with phosphates in your system to create adenosine monophosphate, adenosine triphosphate, and other similar compounds used in energy production. Cordyceps mushroom extract contains numerous benefits. Studies suggest that the high amount of polysaccharides gives the supplement incredible antioxidant properties. Antioxidants fight off free radicals, a product of cellular oxidation in your body. If left unchecked, free radicals can cause damage and increase cellular aging. Antioxidants neutralize free radicals. 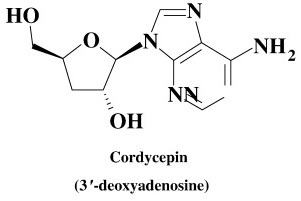 In other animal studies, cordyceps supplements were shown to increase cytokine synthesis. Cytokines are proteins that play an important role in cell signaling and the immune system. Where to Buy Cordyceps Mushroom Extract? Nootropics Depot offers 30g or 60g jars of certified organic Cordyceps militaris Whole Fruiting Body Mushroom Extract. Nootropics Depot's Cordyceps mushroom extract powder has been lab-tested and verified for both product purity and identity. To learn more, read the Cordyceps mushroom reviews and experiences below. You may also be interested in cordyceps whole fruiting body mushroom extract capsules. Cordycepin may help joint pain and inflammation. There is a call for further study into corycepin as a novel relief for OA pain. The 10:1 version has double the cordycepin, but they were out of stock at the time of purchase, and it's more expensive anyway. Goes well with shilajit, milk thistle, Sierrasil, avocodo unsaponofiables, and Na-r-ala ( which is proven to make the unsaponofiables work better according to a study ) for OA pain. Cordyceps gives a smooth boost in energy and motivation, making for positive productivity without the anxious edge that might show up with Polygala or Caffeine, for example. I initially used one dose of 500mg alongside a 100mg caffeine pill to test effects. I now use two doses of 250mg Cordyceps with 250mg Lion's Mane together with 100mg caffeine. I take this dose once in the morning and once in the afternoon, separated by about 4 hours. The effects of the Lion's Mane are very similar but less apparent in some ways; I feel the increase in motivation and focus is stronger with Lion's Mane, but the "activation energy" and mood boost are stronger with Cordyceps. Very similar experiences but with slightly different specs. I haven't had any 'major' changes since starting the cordyceps. I am going to continue because I DO feel a little better....as in more energy. I'll find out next week if it has affected my PSA levels. My previous supply (from a different vendor) was of a brown powder that smelled and tasted of chocolate. I used it for years in hopes of some beneficial effect. The Nootropic Depot extract powder made by Nammex is pale orange, smells a bit of fish. The science behind culturing fruiting bodies and subsequent extraction have me expecting better results. Shortness of breath no longer an issue! In all I'm very happy I purchased cordyceps, its a GREAT addition to my supplement stack! I notice the power of this from the first time I try it. Drink it with my coffee every morning. Can't wait to try the other version. i actually noticed an increase in the energy when taking this. its not stimulating or sedating its just energizing in a balancing way and without a crash. my breathing is much better when i take this and i think more clearly and words/thoughts/conversation flow more easily. it really feels like my blood is ciruclating better and my lungs are getting more air. i took this when i thought i was starting to get sick and the initial symptoms stopped developing and i never actually got sick. This feels like a shot of testosterone with a gentle womanly touch. Powerful and excitatory, but smooth and graceful. I noticed a difference in my respiratory system the first day I tried it, and the effects have only increased with time. My breaths are deeper and my veins are fuller with bloody goodness flowing within me. I like the earthy taste too. Goes well in a cup of coffee. I have already told a couple of my friends that they need to add this to their stack. Nootropics Depot is probably the best source for the mushroom powders, since they use the fruiting bodies, unlike most of the cordyceps supplements on the market. I am very happy with this extract. It's much more effective than I thought it was going to be. I've been taking it before playing basketball with friends, and I have more energy and endurance than I normally would. The only thing I would change is to put it into pills or capsules. Scooping it is not a big deal, but I am lazy. But I am going to certainly keep using this. This blew me away for how effective it was at energizing me. It makes me awake, alert, and focused. I am also finding myself more attracted to women after taking it. I did not know mushrooms could be this strong. I am going to order some of the others now.